Welcome to ONE TRUE HEART. Like waiting for fine chocolate, this book is one you will not want to miss. For me the story is always about the people and I loved writing this story. This one started at a real place I know well, the Amarillo airport where one night a man and a woman meet by accident. She’s exhausted and on crutches. He offers her a ride to Harmony. She’s a trained soldier and sees this professor type in glasses as no threat. Only, while she sleeps, he steals a kiss. When he drops her off at Winter’s Inn, the bed and breakfast, the inn keeper thinks he’s staying the night. For the first time in year’s Drew is tempted to get involved. As books often do, this story didn’t come to me as a thread; it came to me as a ball of multi-color yarn. All of us live lives that are intertwined with those we love or fear or even hate. All of us are looking for one true heart. Some of us settle for less or even give up on finding what we’re looking for, but the people we meet and love all add a depth to us. In ONE TRUE HEART I wanted to show that sometimes loving can win out. I have three heroes in my story. Drew has risked his life once and almost lost it, shattering his dreams. Johnny thinks his dreams are small and is shattered and angry that even his simple dreams can’t come true. Beau, on the other hand, has always dreamed big, but somewhere in climbing the ladder to success he’s lost sight of love. As the story opens all three are about to find a kind of love they never dreamed could happen. The only hard part is going to be hanging onto it. To all my friends and fans, make a cup of tea, or a glass of wine, curl up in your favorite chair and open ONE TRUE HEART. I promise I’ll leave you smiling as you read. Jodi Thomas is the NY Times and USA Today bestselling author of 41 novels and 13 short story collections. A five-time RITA winner, Jodi currently serves as the Writer in Residence at West Texas A&M University in Canyon, Texas. My take: If you’ve been a regular reader of my blog you know I love The Harmony Series by Jodi Thomas. 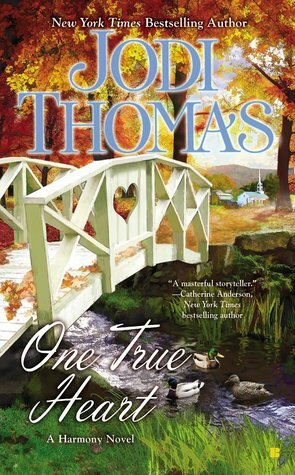 She’s back with the eighth installment, One True Heart. The principal characters are all new to the series but there are a few cameos by some of Millanie McAllen’s relatives who’ve been featured in previous novels. I loved the three storylines of One True Heart. Each character is working to get past a personal history they’d like to forget. Millanie and Drew have survived horrific events and just want to hide out in the Harmony area without details of their past being discovered. Neither expected to meet someone who could make them see a new future. Beau and Lark knew each other in their teens but haven’t reconnected in years. He’s now a successful musician and she is a VP at a local bank. As these two find their way back to each other they might find obstacles too much to overcome. Johnny and Kare have been disappointed by people who were supposed to love them but instead they’ve been left licking their wounds. They’re not looking for love but it could be sneaking up on them. These two were sweet and added comic relief to the novel. I laughed a lot when reading their scenes. As usual, Thomas’ characters are relatable, likable and easy to cheer on toward a happy ending. There’s drama, a mystery and, of course, romance. I’m always a bit sad when I finish one of these novels because I know I have to wait a while for another. Happily, at the end there’s a sneak peek of a Harmony novella that will be part of a new anthology due out in July.